This is a zine of street photography, essays and quotes all about the City of London and the daunting prospect of another four years under David Cameron. The first thing you notice about this zine is the exceptional print quality, it looks and feels absolutely beautiful. Both the writing and the photographs are hard hitting and show a side of London you won't see in any glossy tourist brochures. A must read for anyone with an interest in the Big Smoke. Oh, I do love a lit zine! This one comes by way of Glasgow, Scotland and much like the second issue of my very own lit zine, PAPER AND INK, focuses on the theme of home. This is quite a remarkable debut effort and features some fantastic poetry and short stories, as well as a variety of illustrations. My personal favourite pieces were a majestic poem by Jane Potthast and an enchanting short story by Brighton-based writer Matthew Hamblion. They are currently accepting subs for their second issue on the theme of absent friends, find the details on their Facebook page. This beautifully risograph printed zine is a comprehensive documentation of the history Polish punk and Polish punk zines. Written by Pawel (of Black Eye Press) for his university dissertation, it is an extensive guide to the scene and a really interesting read. I had little knowledge of Polish punk before reading it and certainly learnt a thing or two. 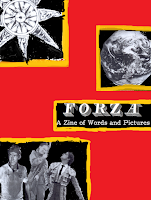 Black Eye Press have a whole selection of interesting zines that are all worth checking out. This is the inaugral issue of a feminist comic zine from LA. The titular hero Kim is hell bent on gaining brutal and bloody revenge on any male rapists/sexual predators/pimps that she crosses paths with. Unfortunately I like the idea and message behind this zine much more than the execution. It all feels very rushed, the artwork is rudimentary, the design is slapdash and the print quality is very poor. My copy was not even bound together and if not for my nimble fingers would surely have fallen apart in my hands. A good idea poorly realised.